I'm looking for writers and readers, and want to give everyone the chance to discuss story ideas with like-minded people and get published. So join me on Facebook if you think that Shoestring sounds like your kind of magazine, want to find out more or even contribute to it! Here are the first three articles I've published as a freelance for suite101.com. The first article is about new World Heritage Sites just inscribed into the list, which are as diverse as Shrines and nuclear testing sites. Then there are the basics of Air Passenger Rights when it comes to European Air Travel. And then there is a little bit about the phenomenom that is Couchsurfing. My First Suite101.com freelance article has just been published! Southport and Ormskirk Mini Owners Club made a real commitment at this years' Woodvale Rally in Southport. Two Minis, called Ursula and Woofer, were married by a member of the club on Woodvale airfield earlier today. While the groom was sporting a bow tie and top hat, the bride wore a veil and pearls around her rearview mirror. The owners read their cars' wedding vows, vowing to drive side by side on motorways as long as their engines may run. Marriage certificates were signed, keys exchanged, the champagne was passed around, and the Mini owners cut specially-made wedding cake. At this time it should be pointed out, that the CARS got married... NOT the owners!! If you have read this blog before, chances are you've heard about my final project, travel magazine Shoestring. I have decided to continue it as a proper online magazine, bigger, better and for a wider audience. To achieve this, I am currently looking for travel savvy writers who would like to contribute. Shoestring is a travel magazine aimed at the 18-30 year old student and gap year travel market. Next to experiences and suggestions for the next trip, I want it to cover advice as well. This can include everything from photo tipps to the best backpacks. I want to introduce an "as the locals see it" section, where twenty-somethings introduce their hometowns and suggest hip places to hang out, cheap thrills, beauty spots, the coolest new bars - that sort of thing. So if you want to introduce a city that you know well, get in touch! At the moment I'm looking for such places like Barcelona, Milan, Rome, New York, London, Sydney, Cape Town and Auckland but I'm open to suggestions. I'm also always looking for simple (and I mean fool-proof), tasty recipes from around the world. Shoestring should also feature outdoor stories, active stories, including extreme sports - but on a travelling angle. This could for example include travelling to New Zealand to bungee jump from the bridge where the sport was invented or crossing China on a pushbike. There are no real limits, as long as it has to do with travelling and is of interest to the target readership. Stories exploring different cultures are also welcome! Have you recently read a really good (factual) travel book? Seen a great documentary? Tried a new travel app on your phone? If so, I'm looking for short reviews. As you see, Shoestring is still in the planning stage, but I want it to be a one-stop kind of magazine, that offers all the info relevant and of interest to the readers. So if you have stories you want to share with like-minded travellers, please get in touch with me at Kaufmann.cornelia@gmail.com or leave a comment on this blog. I can't offer any money but your story will be published under your own name, so this could be a great way to extend your portfolio. If you know anyone who might also be interested in contributing, please spread the word any way you see fit! 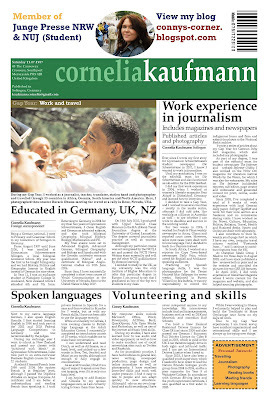 My name is Cornelia Kaufmann, I am looking for work as a journalist in the North West of England and this is my Curriculum Vitae. I was born on 11th July 1987 in Solingen, Germany and I am a German national who has been a resident in the UK since 2007. Currently, I am based in Southport, Merseyside. On 16th July 2010, I graduated from the University of Central Lancashire with Upper Second Class honours in my Bachelor of Arts Travel Journalism degree. This course was not offered anywhere else in Europe, and I graduated as one of the two top students (same grade) in my class. And because this course is not offered anymore, we are also the top two students to ever have graduated with this degree. The degree was taught at the University of Cumbria, which was formerly University of Central Lancashire's Business School and the Cumbria Institute of the Arts. The course included journalism modules such as newspaper production, practical journalism, general law, print and photography, as well as tourism management modules on supply and demand, geography, society and postmodernity. This is what I did to get there. In 1997, when I entered Grammar School, I became one of the first students to be taught bilingually at Gymnasium Schwertstrasse Solingen. This means, I had geography, history and politics lessons in English instead of German. At the end of Year 10 I decided to spend a year in Auckland, New Zealand as an exchange student at Waitakere College. Here, I attended 6th and 7th Form classes, including Geography, Photography, Drama, Classical Studies and English while living with a host family and exploring the Land of the Long White Cloud at the age of 16. Returning home, I attended Years 12 and 13 at Gymnasium Schwertstrasse and graduated with Zeugnis der Allgemeinen Hochschulreife (Abitur - the German university entrance qualification) in June 2006. Due to being taught bilingually, I also received a Certificate of Anglo-German language skills. My Final exams were sat in Advanced English, Advanced German, Biology and bilingual Geography. After Grammar School, I decided to take a Gap Year and work all around the world. I was a journalist for weekly paper People & Places in Accra, Ghana reporting court cases for two weeks. However, since I don't speak local language Twi, I decided to teach children in a Day Care instead and so became a teacher for 5-year-olds at Little Angels Early Childhood Development Centre in Achimota. In my free time, I travelled with my host family and helped build an orphanage in a neighbouring village. In South Africa, I spent three weeks in Johannesburg, where I acted as a substitute teacher for two local schools in Reiger Park. During these two weeks, I also translated STAESA's website from English to German (the website has been re-developed and does not include the German translation yet) and I also took Afrikaans lessons. In Cape Town, I was a reporter for local English and Afrikaans newspaper Daily Voice for five weeks before honing my photography skills on a four-week overland tour from Johannesburg to Nairobi. In Australia, I completed a course and worked as a Jillaroo in New South Wales. I decided to work as a cowgirl in order to try something new and also to show that I am not afraid to get my hands dirty - literally. I then went into the Outback and around New Zealand, to practise my photography skills. My next assignment saw me as the photographer for the Parque Nacional Galápagos Islands in Ecuador. I was stationed in Puerto Villamil on Isla Isabela for seven weeks and it was my job to take photos of all aspects of island life, including the indigenous fauna and flora. In May 2007, I reached the United States of America, where I studied Visual Communication in a summer session at the University of Nevada, Reno which I finished with grade A, before travelling across the northern states for three weeks. During my Gap Year, I published a series of articles with German Itchy Feet magazine. Since I started university in September 2007 in the United Kingdom, I have done two months of work experience with the daily local newspaper Solinger Tageblatt in my hometown during semester breaks. I have contributed to all desks of local news, including the bi-weekly youth page Karl. for which I continue to contribute from the UK. I also contribute to the Solinger Tageblatt as a freelance and on story commissions everytime I'm back in my hometown, as of special request by the editor. In August 2009, I did work experience with the Champion Media Group in Southport and have since contributed reviews for their weekly series of papers, as well as for their website. I have also contributed the photography for some GR8 Life magazine features. During my time at university, I was also part of the editorial team for The Informer, the student newspaper in Carlisle. At The Informer, I held positions as reporter, proofreader, page designer, sub-editor, pictire editor, webmaster and editor and published articles for three years. The Informer team also published the official magazine for Words by the Water literature festival which was called Write On!, as well as several student magazines like Horizons, and the magazine for the Carlisle Arts Festival C.A.F.ine. Over the Easter break 2010, I worked at Wanderlust travel magazine in Windsor, to finally gain some experience in the travel sector. There I was working in editorial and helped research and write destination guides, as well as sourcing and editing pictures. My final project was a travel magazine entitled Shoestring, for which I was editor, photographer and designer. Next to my native language German I also speak English fluently. My spoken English is without any sign of a German accent and I am able to translate from one language to the other instantly. Next to German and English, I've had French lessons at school, speak French on a basic level and hold the DELF A1 certificate. I learned Spanish through private lessons, and spent seven weeks in Ecuador, but due to not having had to speak any Spanish in three years, my language skills are only basic. I took British Sign Language classes and I am always trying to learn a few words in other languages as well. During my degree, I sat and passed the NCTJ News Writing exam, and will continue to study towards the other NCTJ preliminaries by distance learning, as my degree was not accredited by the NCTJ. I did, however, gain excellent computer skills and knowledge using Microsoft Word, Excel, PowerPoint, as well as publishing software QuarkXpress and Adobe programmes such as Photoshop and Acrobat and basic html skills which I practised as webmaster for Write On! as well as on this blog. I have basic working knowledge of Burli and Final Cut Pro programmes, and have published my photography in a variety of outlets such as newpapers, magazines and a book. While I work very well on a team, I am also able to take initiative, motivate myself and work independently. I am always determined to get the job done to the very best of my abilities and I am enthusiastic about what I do as various recommendations can testify. I've held a full German/European driving licence since 2005 and I have a car at my disposal. So if you think I'm qualified, experienced and enthusiastic enough for a media job in the North West of England, please contact me either through this blog, by email on kaufmann.cornelia@gmail.com or by phone on 07517226 100.